While the dividend rate being paid by new issues of the highest quality preferred stocks has returned to pre-crisis levels, bank Certificates of Deposit (CDs) are still heading the wrong direction. For the first time in many, many years, the average of the top ten interest rates that you can earn on a 24-month bank CD in the U.S. fell below 2% during May. 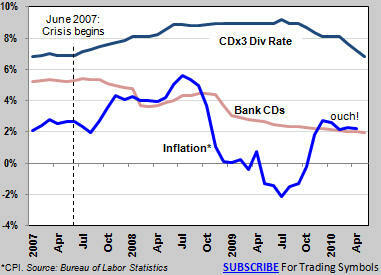 The average of the top ten 24-month bank CD payers in the U.S. at the end of May 2010 was 1.972% (taxable). As investors, we choose our investments from the alternatives available at the time. We make the best decisions that we can make from the available alternatives at the time that we have to make them. We shop. Since most preferred stock investors are low-risk investors, we continually find ourselves comparing the yields provided by bank CDs to those offered by the highest quality preferred stocks ("CDx3 Preferred Stocks," see sidebar at the top of this newsletter). Three years ago, in May 2007, just before the Global Credit Crisis began, high quality preferred stocks offered an additional annual return of 1.7% over and above what a 24-month bank CD was paying (chart 1). Newly issued high quality preferred stocks were offering an average dividend rate of 6.9% while a 24-month bank CD was offering 5.2%. So an extra 1.7% was what it took in May 2007 to motivate investors to invest in CDx3 Preferred Stocks rather than bank CDs. Now, three years later, the dividend rate offered by newly issued CDx3 Preferred Stocks has returned to its pre-crisis level (about 6.8%). 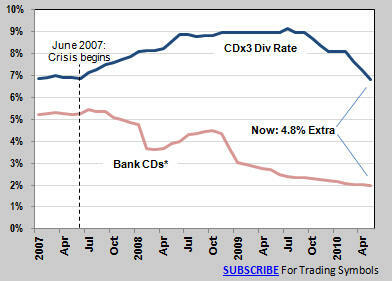 But bank CDs have yet to recover. 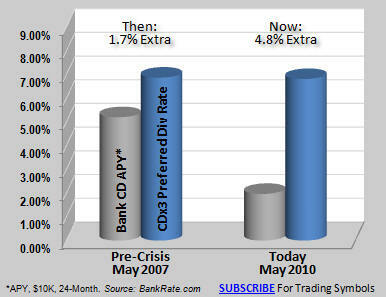 During the Global Credit Crisis bank CD interest rates dropped and they are still dropping (chart 2). Bank CD interest rates are much more closely tied to the Federal Reserve's monetary policy than is the dividend rate being offered by newly issued higher quality preferred stocks. Since the Fed still has the federal funds rate set at near-zero in order to help stimulate the economy, we have a case where CD interest rates continue to fall even though CDx3 Preferred Stock dividend rates have returned to pre-crisis levels. 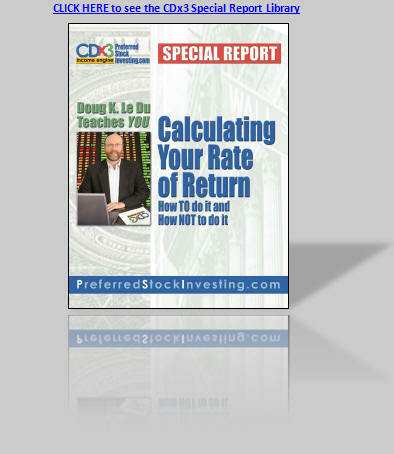 Since CDx3 Preferred Stock dividend rates have returned to normal, bank CD interest rates that continue to fall have created a massive premium for preferred stock investors. The gap between the two is now 4.8%, up from the pre-crisis level of 1.7%. Preferred stock investors are being paid an extra 4.8% per year not because preferred stock dividend rates have gone up, but because bank CD interest rates are now at some of the lowest levels that we have ever seen. Two percent is an important rate for bank CD investors because the Federal Reserve has a stated policy of keeping the annual inflation rate at, or below, that level. An inflation level of 2% is actually pretty healthy. 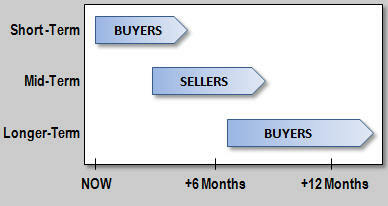 It indicates that there is consumer demand throughout the economy and economic growth. But it also means that if you hold a bank CD that pays less than 2%, you are losing all of your interest earnings to inflation. By the time that CD matures and you get your principal back from the bank, you will have less purchasing power than you use to have, despite the interest earnings. The April 2010 Consumer Price Index (latest available) came in at 2.24%. Since the interest rates being paid by bank CDs have continued to fall, they have now fallen below the rate of inflation (chart 3). And don't forget that the interest earned by those bank CDs is taxable as well. Bank CD investors need to understand that the net annual return on bank Certificates of Deposit is currently less than zero. No single investment is perfect for every investor and that is just as true with high quality preferred stocks. And the euro mess has caused U.S. goods and services to become more expensive for Europeans, reducing inflation pressures here in the U.S.. So we should see the inflation line start to move down in the coming months, at least temporarily. But when the rate of inflation moves above bank CD interest rates, which it is right now, low-risk investors may find that high quality preferred stocks offer a more attractive alternative. 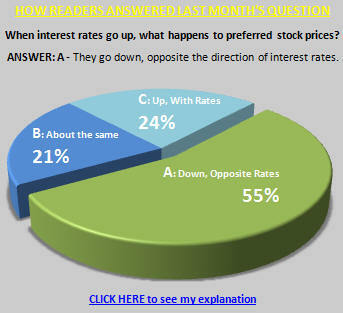 As discussed in the sidebar at the top of this newsletter, high quality preferred stocks carry investment grade ratings, are issued by a company that has never suspended a preferred stock dividend, have the "cumulative" dividend requirement (which means that if the issuing company skips a dividend payment to you they still owe you the money) plus meets the other seven selection criteria itemized in chapter 7 of my book, Preferred Stock Investing, Third Edition. With bank CD rates so low, and likely to stay that way for "an extended period," maybe it's time that you considered the highest quality preferred stocks. Invest in the best. Subscribe to the CDx3 Notification Service (see reader comments) today. Vornado, one of the largest owners and managers of real estate in the United States, is a $14 billion real estate investment trust headquartered in New York City. 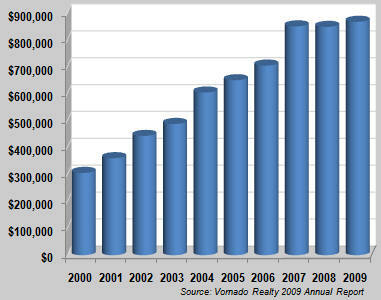 Vornado has over 100 million square feet of office and retail space in its portfolio. Its major holdings include 28 office properties in New York City (primarily midtown Manhattan), 81 properties in Washington D.C., 164 retail properties in 21 states, Washington D.C. and Puerto Rico and the 3.4 million square foot Merchandise Mart in Chicago. Among its competitors, Vornado is very interesting in that it operates a bit outside the box. Where most of its competitors build or buy buildings and lease them out, Vornado not only does that but in many cases takes an ownership role in some of its larger tenants. For example, in 2006 Vornado acquired a 33% interest in Toys R Us which was performing badly in the face of stiff competition from Wal-Mart and Target. After hiring ex-Target executive Gerald Storch, the company returned to profitability and in May 2009 bought out competitor FAO Schwarz. After the acquisition, Storch located FAO boutiques in over 600 Toys R Us stores to leverage the brand's image of quality and customer service. Now profitable, on Friday, May 28, 2010 Vornado and its partners in Toys R Us announced in an SEC filing that they will be taking the retailer public under the NYSE trading symbol TOYS in an $800 million IPO. Acquiring an interest in your tenants allows you have more control of the lease. In 2006 Vornado acquired the retail portion of 1540 Broadway, the best block front in Times Square that, at the time, housed a variety of under-market tenants including Virgin. Not only did Vornado acquire the property, but they went on to acquire the entire 11-store Virgin chain in order to get at the lease. With this property now sporting new tenants, Vornado will realize a double-digit return on their $350 million investment. Learn more about Vornado: Company website | Profile | Upgrades/Downgrades | Recent News. Thanks to subscriber "mnwoods" who posted this question to the CDx3 Discussion Group on the subscriber's website. 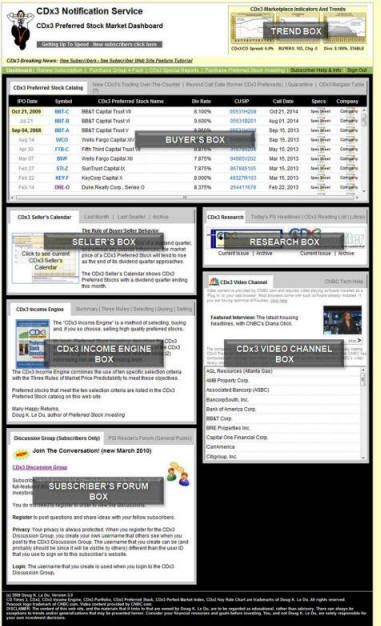 Subscribers to the CDx3 Notification Service have access to the CDx3 Discussion Group, the only online forum just for preferred stock investors. It's a great place to ask questions and share ideas with fellow CDx3 Notification Service subscribers - brokers, financial planners and seasoned preferred stock investors from all over the world. The perfect storm that will occupy our headlines for several more months (SEC/Goldman, bank regulation, Greece/eurozone, BP/oil, Korea) is producing short-term (and short-lived) buying opportunities for those investing in high quality U.S. preferred stocks. Over the next six to twelve months, however, these events are likely to result in a period of stable or slightly higher preferred stock market prices (good for sellers). And over the longer-term (next year) the market prices of existing high quality preferred stocks are likely to be somewhat lower again, producing another portfolio-building opportunity for preferred stock investors. Here's why. Immediate-Term, Right Now: As I mentioned to you last month, on days when big negative headlines appear, market prices have been taking short-lived down spikes, creating buying opportunities for a very specific list of eleven high quality preferred stocks. These down spikes are only lasting for a few days, if that, but have been really great for buyers. Over the last few weeks we have been able to purchase CDx3 Preferred Stocks from this list at market prices that we thought were gone forever. The list of these eleven specific preferred stocks was provided to CDx3 Notification Service subscribers in the May issue of the subscriber's newsletter, CDx3 Research Notes. Mid-Term, Six To Twelve Months: The Greece/eurozone component of the perfect storm is easing U.S. domestic inflation because it is strengthening the U.S. dollar in relation to the euro. Before the Greece/eurozone debt meltdown started to gain speed a couple of months ago, Europeans were able to buy about $1.50 worth of U.S. goods and services with one euro. Today, however, their euro only buys them about $1.25 worth of U.S. products. So euro-using consumers now have to spend more euros when shopping for U.S. goods, pushing European consumers away. Consequently, the Greece/eurozone mess has eased U.S. domestic inflation pressure. Also, the Greece/eurozone sovereign debt crisis has caused large global investors to move away from eurozone-issued debt securities (eurozone government bonds) and move into U.S. treasuries. This huge increase in demand for U.S. treasuries has increased their market price and, hence, lowered their yield. Just as with a strengthening of the U.S. dollar against the euro, falling treasury yields also takes pressure off of the Federal Reserve to start increasing the federal funds rate. Increases in the federal funds rate tend to lead to lower market prices for preferred stocks. While good for buyers, an increasing federal funds rate tends to take away the great selling opportunities that preferred stock investors have been enjoying for over a year now. So the Greece/eurozone mess has reduced inflationary pressure while simultaneously pushing treasury yields down, both affects allowing the Fed to delay any pending increase in the federal funds rate which, in turn, relieves downward pressure on preferred stock market prices. Until the Fed starts raising the federal funds rate again, U.S. preferred stock investors are likely to continue enjoying selling (capital gain) opportunities. Longer-Term, 2011? : Once the Fed starts increasing the federal funds rate, which is now less likely to happen this year than it was before the perfect storm set in, preferred stock investors will see two things happen, both of which benefit buyers: (1) the dividend rate offered by newly issued preferred stocks tends to increase right along with increases in the federal funds rate (although there are occasional, short-lived exceptions) and (2) market prices of older, existing preferred stocks will tend to fall. Increasing dividend rates combined with bargain basement market prices produces a great opportunity for preferred stock investors to build their portfolios with high yielding (8%+), high quality issues. At the moment, we are looking forward to next year to do so.